The Teen Art Contest is for teens and by teens. Teens create the art. Teens determine the winners. Every story, adventure and journey starts from square one. The theme for our 2014 Teen Art Show & Contest was: Art2. Art Squared allowed the artist to choose the content and the medium. Our only request? The artwork must be square. All of the artwork will be displayed at either Penrose and East Library during the month of April. 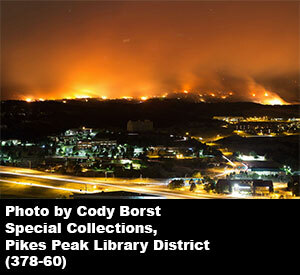 Special Collections at Pikes Peak Library District has just published online the Waldo Canyon Fire Digital Collection, consisting of reports, press releases, maps, photographs, videos and oral history interviews relating to the fire that devastated Colorado Springs in 2012. The collection contains materials created by local, state and federal agencies, interviews with affected residents and first responders conducted by Pikes Peak Library District, as well as powerful photographs, made by Colorado Springs residents and donated to PPLD, of the fire and its aftermath. It is intended to provide a comprehensive collection of documents for researchers today and long into the future. With more than 400 items in the collection currently, it is expected to grow significantly in the coming months as more materials are added. 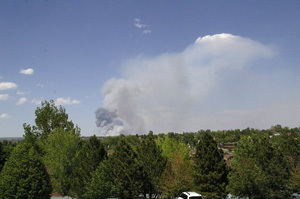 Explore the Waldo Canyon Fire Digital Collection on Pikes Peak Library District’s Digital Collections site at http://ppld.org/digital-collections. Guests arrived at Grace and St. Stephen’s Episcopal Church in period dress and with their favorite tea cup for the Downton Abbey Tea and Tour, benefitting PPLD’s 21st Century Library Campaign. As harpist played, guests participated in Downton Abbey trivia, enjoyed British treats from local bakeries and sipped tea served from beautiful silver tea sets provided by Montague’s Parlour. Docents gave tours of the Church, explaining the fascinating history behind the Gothic Revival structure and the ornate stained glass and décor. Mr. Carson, Don Moon of Red Herring Productions, made an appearance for the evening and had his picture with guests in their lovely period outfits. To view pictures from the evening please click here. Many thanks to all that participated in the Downton Abbey Tea and Tour! A great time was had by all at 'A Novel Evening: The Great Gatsby', a special event benefiting the Manitou Springs Library. We are looking to fill in gaps in our Pikes Peak region high school yearbooks collection. After several years of contacting high school yearbook offices and alumni groups, we have added several hundred more volumes, but we still have holes to fill. 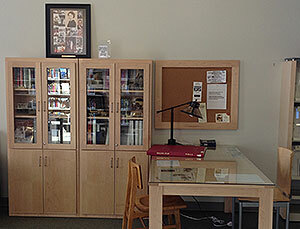 We are the main repository in the area for these yearbooks and perhaps the only place where they are easily accessible. They are used extensively by our genealogy patrons, high school students, and those recently graduated from high school. To serve our patrons better, we would like to have as complete a collection as possible. Therefore, we would like to appeal to our patrons to complete this task. Click here to see which yearbooks we are missing. If you have any yearbooks on this list that you are willing to donate to us, please contact the Library at (719) 531-6333, x1253. 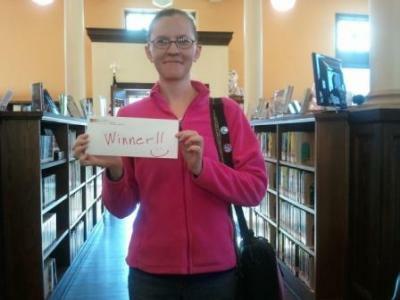 Old Colorado City Library is pleased to announce the winners of our essay contest, My Westside--Our Voice. Our generous Friends of the Library supported this programming with a $100 prize for first place. The winner, Sarah Pottenger, is also published in the November 21, 2013 edition of the Westside Pioneer. Enjoy reading her essay along with our runners-up, Andrea Corley and Victor Shepard. I’m a third-generation Colorado Springs native, and I’ve never wanted to live anywhere else. I grew up near Academy Boulevard, but some of my best memories are of visits to the Westside, whether to visit my parents’ old haunts, see the house where my grandmother was born, or just to take the car to the mechanic. Driving to the Westside was an event, taking half an hour. I lived in that same house off Academy for twenty years. Then my family downsized from our house to a duplex just north of Old Colorado City. We moved here in 2010, and though it was a terrible move, we were here. For my parents, returning to the Westside was like coming home. For me, it was a dream come true. Every week one of us remarks that we still can’t believe we get to live here, even after nearly four years. As a lifelong reader, I love the Old Colorado City Library. We can drive there in just a few minutes, or walk in half an hour. I probably visit three times a week, and it’s the prettiest, friendliest library in town. We’re also just minutes away from Fire Station #5, housing the wonderful firefighters who not only came to our rescue when my bedroom flooded during the September 12 storm, but also arrived within moments when my dad suffered a heart attack right before Christmas last year. When we were children, my brother and I loved to come to the Westside. The Creamery was (and still is) our favorite ice cream shop. We liked to visit souvenir stores, dipping our hands into wooden bins brimming with polished rocks. My parents pointed out houses belonging to friends and relatives. My mom told stories about running downhill from school and spending nights with her grandparents, one set on Chestnut and one set on Uintah. I have always loved it here. I pinch myself every day, hardly believing that I get to live here, that every time the car heads west, I’m going home. It’s funny how memories work. The passing of fifty five or so years doesn't diminish the desire to somehow recapture the beauty and love that were experienced so long ago. I know the ice cream was much sweeter and creamier then. The flowers my grandma raised were much more fragrant than flowers are today. And most definitely people were so much kinder then. People didn't have the apprehension and distance that is so prevalent today. At least that’s the way I choose to remember it. Every child looks forward to summer and my summers always included visiting my grandmother in the “burg” of Colorado City. This was the main highlight of every summer and a time that I remember fondly. Grandma’s house was only a block away from the library where I read the adventures of the places I was going to visit one day when I was “old.” In close proximity were the drug stores with real fountains like Cooper-Lidke and the Rexall, a good place to get a chocolate or cherry Coke. Then I’d buy a fifteen cent wooden plane at the Duckwalls, which would last about ten minutes. In the center of this playground neighborhood was a park to play in with a central square and the treasure of the town, the first capitol of Colorado. This park was a hub where the entire neighborhood was welcomed and encouraged to come to. Wednesday nights in the “burg” were the most special because that was the night when there was square dancing in the park. Although I was only six or seven, it was a weekly ritual that included special food and more importantly, staying up late. I’d get to wear my little cowboy boots and western shirt and get pinches from my grandma’s friends. Watching the big people in their fancy clothes, swiftly moving through difficult dance maneuvers, was quite a sight. But they all seemed happy and certainly appeared to be having a good time. Eventually, the inevitable happened, grandma wanted me to ask a very apprehensive little girl to dance. I was not a completely willing participant in the process but the coaxing finally compelled us wee ones to join in the confusing mob moving to an old man’s call on a screechy microphone. We were both confused and afraid of being trampled by the big people as they sashayed and promenaded around in close order. Somehow we devised our own rhythm and moves and somehow managed to avoid serious contact and injury. The more time we spent dancing the more fun it became. The dance seemed to last late into the night, and I must have been especially tired, as my grandma was forced to carry me home. Yes, memories can cause us to smile and dancing can still wear me out but I wouldn't trade a moment I've experienced for half a dollar. I still love the park, the band shell and the fistful of valuable and memorable experiences that Bancroft Park has given me throughout many happy years. I am a transplant, not a native Westsider. I came here to college and really never left. I have lived in the same place on the Westside for 46 years. I married a local man with Westside ties – railroad ties. His grandfather bought one of the railroads that traveled through the Westside to Cripple Creek a century ago, tore it up, sold the rolling stock and made a toll road for automobiles on the CS&CCDRY bed. It is now called the Gold Camp Road. Yesterday, driving with a friend on Lower Gold Camp Road, we passed the ground-breaking for a new facility east of my friend’s home at The Village at Skyline. She did not know what is to be built there, but reading the current Westside Pioneer I learned it is to be a memory facility called Morning Star at Bear Creek. I thought” how fitting” in an area full of my family’s memories. The road we were traveling on next to this new facility was once-upon-a-time the initial part of what was called the Corley Mountain Highway. It was gently graded for train traffic first, as the route west out of Colorado Springs to the foothills for the railroad nicknamed ( because it was) the Short Line to Cripple Creek. Now a city street, Lower Gold Camp Road has become, according to Bill Vogrin in the Gazette, a race track for prospective buyers testing their new cars. Next time you are there, testing or not, imagine the trains going and coming on that very roadway, loaded with freight or gold ore depending on the direction of travel, plains or mountains up ahead, tracks and ties, not tires, underneath you. Then, remember the clickety-clack rhythm of any train ride you have taken, and this becomes Time Travel for the Twenty-first Century with memories of your own. For me, a transplant in my adopted neighborhood, it becomes ties to my family members in their own time and place. 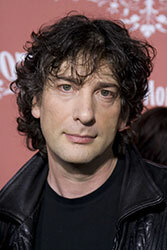 In a recent lecture, celebrated author Neil Gaiman discussed among other things why libraries are so important to the future, how important it is to read for pleasure, and how there is no such thing as a bad children's book. "... Libraries are about freedom. Freedom to read, freedom of ideas, freedom of communication. They are about education (which is not a process that finishes the day we leave school or university), about entertainment, about making safe spaces, and about access to information." Read the transcript in its entirety here. Tom Clancy (April 12, 1947 – October 1, 2013) was an American author best known for his technically detailed espionage and military science story lines that are set during and in the aftermath of the Cold War 1. Clancy's books were made into several successful films, including The Hunt for Red October, Patriot Games, and Clear and Present Danger. 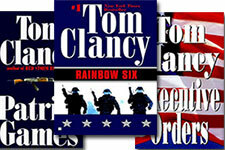 Click here for a list of titles by Tom Clancy in the Catalog. The Pikes Peak Poet Laureate recently joined forces with the Pikes Peak Library District Lobby Stop Van to visit various senior centers throughout Colorado Springs. "Two residents approached as we were leaving and said, 'thank you so much for bringing poetry to us!'" We are collecting images for an online photo gallery, which you can send to photos@ppld.org. Feel free to include any personal accounts associated with the image, which we will use as a caption. Please note that we cannot receive email attachments larger than 8 megabytes at a time. If you have multiple images, please send them individually. Please limit your submission to five photos total. In addition, we are seeking video and high-resolution photos for our Special Collections archives for the use of future researchers. If you have video or high-res pictures you would like to donate to our collection, please email us at photos@ppld.org with “Archives” in the subject line so that we can arrange acquisition of your photo or video. Do not email your high-resolution images, but you can send samples. Keep in mind we have an 8 megabyte attachment limit. Please do not email video files, but links to online streaming (YouTube, etc.) of your video footage are okay. PPLD would like to thank Major General Mike and Elinor Ingelido, Carnegie Society Members, for their gift to the children of Cheyenne Mountain Library. Can’t find the information you need? Have a research project? Pikes Peak Library District has a brand new program to help you. Professional librarians at East, Library 21c, and Penrose Libraries are available to assist you with your information needs, whether you are looking for a great book to read, starting a business, or researching local history. Research topics include, but are not limited to, finding materials for children or teens, locating health and wellness information, beginning legal research, and finding grant information for nonprofits. If you would like to learn how to search the library’s catalog or subscription databases more efficiently, we can help you with that too. Begin by completing the online form on our website. From our home page (ppld.org), click on Research and select Book a Librarian. You can also locate the service by clicking on the dropdown arrow under "How do I?" on the left side of the home page and selecting Book a Librarian. Fill out the form with your information, including your library card number. If your research request differs from the options provided, describe your question or research need in as much detail as possible. We’ll look at your request and determine the best person on our staff to meet with you based on expertise and availability. We’ll get back to you as soon as we can to schedule your appointment. Appointments may be scheduled for up to one hour at either the East or Penrose Library. The Book a Librarian service is open to any PPLD cardholder. We cannot offer advice (e.g., medical, legal, investment) except to advise users of reputable sources of evaluative information. Also, we cannot offer troubleshooting or maintenance help with personal computers or devices. However, computer classes are available at several PPLD locations. For questions, you can contact PPLD by email, chat, phone, or in person at any of our locations. What do you get when you give "kindie" musician Steve Weeks and PPLD TV producer/director Dave Franklyn access to paper, glue, scissors, cardboard, paint, and string? Watch the new music video for Steve’s latest single “Change of Heart” and you’ll find out! Weeks has already made his mark on the national music scene with four critically acclaimed CDs, multiple #1 hits on Sirius XM satellite radio channel 78 (Kids Place Live), and a first place award in the USA Songwriting Competition children's music category. Greedy Pig, an accomplished paper puppet and star of the film claims to be an Oscar contender for his role, although few believe that he is cut out for it. In an historic election on November 6, 2012, Manitou Springs residents voted to have their local library become part of Pikes Peak Library District. The approved Issue 2B will raise property taxes by up to 4 mills in Manitou Springs, generating $240,000 in 2013 and allowing Manitou Springs Public Library to join PPLD and its 14 other facilities serving El Paso County. The Manitou Library was among proposed budget cuts in Manitou Springs before citizens petitioned to place Issue 2B on the ballot. 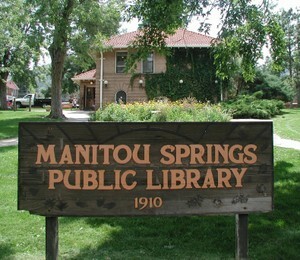 MSPL was excited to hear that library service to Manitou Springs residents would not only continue, but be expanded. While the transition will not be officially effective until 2013, PPLD will soon begin issuing cards to all Manitou Springs library patrons who wish to begin using PPLD services immediately. Manitou patrons will still need their MSPL card to check out materials from the Manitou Library until the end of the year. A celebration of this historic transition will occur at MSPL in January. The American Library Association's (ALA) Virtual Read-Out is a great opportunity for people to share their favorite banned book. During Banned Books Week (Sept. 30 to Oct. 6, 2012) we had a few of our teens read for us! Check it out! Check Out eMagazines on CyberShelf with Zinio! Zinio, offered by Recorded Books (RB Digital), provides thousands of publications on a wide range of topics- a digital newsstand – with complete content from cover to cover. Public libraries can select and subscribe to publications of interest to their communities. Simultaneous access is included. Everyone in town could be reading Consumer Reports free through their public library using their library card. Access is available on any internet-enabled device. Patrons can download a title or many titles and will be notified when the next issue is available. In addition to Consumer Reports, other titles include The Economist, HELLO!, Car and Driver, Food Network Magazine, House Beautiful, Holiday Baking (Yes, it includes special publications! ), Publisher’s Weekly, Science, US Weekly and many more! Click here to access Zinio now! Join the Friends of the Pikes Peak Library District! To join the Friends of the Pikes Peak Library District, please complete a membership application or visit our Join Us page. Feeling good about supporting a vital resource that benefits our whole community. Congratulations to the 2012 Teen Fiction Contest Winners! First Place - Cecilia Lee for "Flooding Gifts"
Second Place - Helen Stritzel for "Sisters and the Scent of Cloves"
Third Place - Kristen Hernandez for "Trapped"
First Place - Mariah Mayhugh for "Blind Friendship"
Second Place - Emily Ford for "The Attic's Secret"
Third Place - Hannah Kaupp for "I Love Him, Not You"
Pikes Peak Library District employee Vincent Colicchio never considered himself an artist, but he became one nonetheless, through the curiosity and caring he exhibited at his job in Circulation at PPLD’s downtown Penrose Library. According to Colicchio, “It began by me saying, ‘That’s a treasure. That shouldn’t be thrown out.’ "
Colicchio handles books for a living, so he sees a lot of them on a daily basis. But he recently found his love of books extending to damaged books that were being discarded. “I, like other people who work in libraries, get heartbroken when I see books in the recycling bin. I think it’s a waste,” he said. When Colicchio turned his eye to the bare shelves behind the checkout desk at Penrose Library, the altered book project began to take shape. Colicchio recently donated two of his altered books to the Colorado Library Education Foundation for their upcoming silent auction to raise funds for scholarships for Colorado library employees to attend Colorado Library Association and division workshops and the annual CAL conference. Colicchio’s art speaks to the great potential of books -- even discarded books--to enrich and change lives. The images below show the extreme care and detail Colicchio brings to his work. 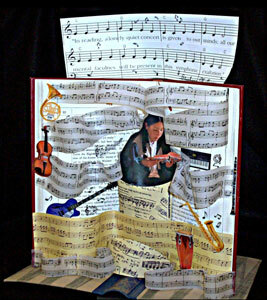 The work is even more impressive in person and is currently on display in the Friends Bookstore in East Library. The short documentary chronicles the work of Stan Payne, a Gazette Telegraph employee from 1947 to 1976, and was based on research by PPLD Special Collections Assistant Manager Dennis Daily. 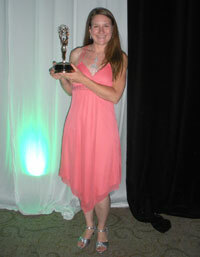 The Heartland Chapter Emmy Awards represent excellence in television and media production. We are collecting images for an online photo gallery (see below), which you can send to photos@ppld.org. Feel free to include any personal accounts associated with the image, which we will use as a caption. Please note that we cannot receive email attachments larger than 8 megabytes at a time. If you have multiple images, please send them individually. Please limit your submission to five photos total. In addition, we are seeking video and high-resolution photos for our Special Collections archives for use by future researchers. If you have video or high-res pictures you would like to donate to our collection, please email us at photos@ppld.org with “Archives” in the subject line so that we can arrange acquisition of your photo or video. Do not email your high-resolution images, but you can send samples. Keep in mind we have an 8 megabyte attachment limit. Please do not email video files, but links to online streaming (YouTube, etc.) of your video footage are okay. 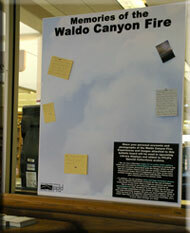 The 2012 Waldo Canyon Fire is a tragedy, but the response by individuals and organizations has been truly inspiring. PPLD is proud to assist our community during this trying time. In addition to being an air-conditioned refuge from the heat and smoke, PPLD has extended a helping hand in other ways. On Sunday, June 24, Penrose Library remained open four hours later than usual to help meet the high demand for Internet usage by people needing to communicate with friends and family. The Library has also set up mobile Laptop Labs at the Red Cross Shelters at Cheyenne Mountain High School and The Southeast YMCA for evacuees. Clifton Medford, IT Technician at PPLD, said the Library plans to have the laptops available at the shelters until they close. “My hope is to be here until everything is cleared,” he said. 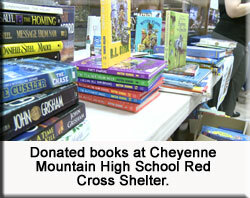 PPLD and Friends of the Pikes Peak Library District have also donated hundreds of books at each location for evacuees to keep. In addition, the Library is dedicating public service staff to help evacuees register on the Red Cross Safe and Well website. Use of the East Library webcam has boomed, as people throughout the world search for a view of the devastation. PPLD has received an outpouring of supportive statements and offers for assistance from other libraries, including the Colorado State University-Pueblo Interlibrary Loan Office, Arapahoe Library District, Jefferson County Public Libraries, and Denver Public Library. It is heartening to see a community unite, even if it is in the midst of disaster. In times of tragedy, you tend to see the best of human capability: bravery, shared passion, compassion, the opening of doors and minds to strangers. It is times like these we are forced to remember we are all connected in ways more than geographic.